A demand for cleaner sources of energy and a reduction in emissions has led to an increase in the adoption of alternative energy sources. One such source is nuclear power, which is dependent on uranium – a currently somewhat ‘unloved’ metal in the commodity world – but who knows for how much longer. Uranium prices are at the lowest they have been in a decade, and just like every commodity, the cycle is set to turn. 86% of energy utilities have not contracted their uranium for 2018 to 2022. It’s all shaping up to be what could be one of the biggest supply deficits the world has ever seen. One company we think has a particularly good shot at making its uranium supply ambitions come to fruition is Berkeley Energia (ASX | LSE: BKY). BKY is currently developing Europe’s only major uranium mine. BKY has spent a decade in exploration and invested US$60M on its Salamanca Mine in western Spain, before finally bringing it into development in August 2016. The company’s goal is to establish Salamanca as one of the world’s lowest cost producers, supplying long term customers throughout the European Union. Its capital costs of $100M are the lowest they could be for a top ten uranium producer. Furthermore, the operating costs are currently half of the uranium price. With the tide seemingly turning for uranium prices, and European utilities starting to get hungry for new uranium suppliers, it all bodes well for BKY’s Salamanca Mine – the only major uranium mine in the world currently under construction. Once in production, BKY will be one of the world’s largest producers, supplying over four million pounds of uranium concentrate a year, equivalent to approximately 10% of the EU’s total requirement. The mine is expected to come online and start producing in 2018, which is fortuitous timing. As we highlighted above, expectations are that when Salamanca is scheduled to come into production, demand will be surging upwards. It is just at this time that US and EU utilities will commence re-contracting for medium to long term supply. In addition to this, it is estimated that China’s nuclear plans will require a five-fold increase in annual uranium demand. To meet this demand, BKY has begun discussions with potential strategic partners which has already led to a signed Letter of Intent (LOI) with European based commodities trader Interalloys, relating to the sale of Salamanca’s first million pounds of production at US$41 per pound (current spot price is $22 per pound) over a five year period commencing in 2019. 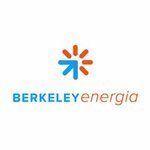 BKY is also in discussion with several utilities companies and has even been invited to tender for a ten year, 11 million pound supply contract with a major Asian utility. A Definitive Feasibility Study released in July 2016, indicated the project has a Net Present value of over US$530M, and can produce 4.5 million pounds per annum at cash costs of US$15.39/lb. This would catapult BKY into the top ten global producers of uranium, supplying the world’s leading utilities with fuel for base load clean energy. BKY has courted the affections of financial powerhouses such as Blackrock and JP Morgan to fund the construction of its flagship US$100M Salamanca mine and recently concluded a US$30m placement to further fill its coffers. This highly successful, oversubscribed placement experienced strong institutional support by London based blue chip generalist institutions, who will dominate the register. Funds from the capital raise will be used to accelerate works as it heads towards production in 2018. Given its proactive efforts, BKY is on track to become the leading uranium miner in Europe and is quite literally glowing with potential right now. We’re here to keep you posted as it builds towards substantial commercial nuclear supply. 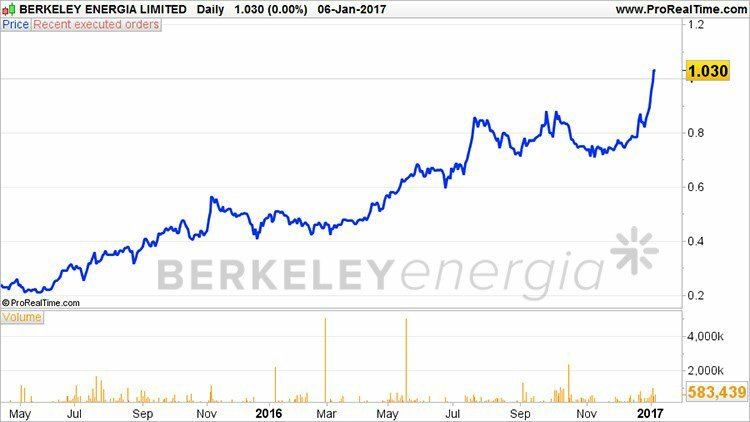 Berkeley Energia (ASX | LSE: BKY) is a dual listed near term uranium miner. In Australia, its current market is AU$176M and priced at AU$0.75 per share. BKY’s share price has been on an upward trajectory for almost the entire year, yet actual production remains pencilled in for 2018 – indicating there may well be more upside to come. If we take a look at what’s been penned however, it’s clear why BKY could be sizzling its way to new highs. Located in the central west of Spain is BKY’s premier Salamanca uranium project that hosts a combined 82.6Mt with 89.3 Mlbs U 3 O 8 . The Salamanca project consists of 3 deposits — Zona 7, Alameda and Retortillo as shown above. Out of the three deposits Zona 7 is the most advanced with over 11,000m drilled in 2016 alone. Zona 7 also hosts ten near surface targets, with uranium deposits at shallow depths, allowing for an open pit construction which may become an underground mine as the project advances and further exploration is carried out at depth. BKY’s presence in the area is welcomed and supported and there are no stumbling blocks from a public interest perspective. With approvals in place for initial infrastructure development, BKY has now entered the development stage of the project, beginning with road realignment and power line upgrades ahead of the main construction phase which begins next year. The mine is expected to rejuvenate the economy in this region, creating 454 jobs one in full production, and a further 2295 jobs indirectly. BKY has bagged a Letter of Intent (LOI) with EU-based Interalloys Trading Ltd., to sell its first one million pounds of uranium at an average price of US$41/lb — while current uranium prices languish around the US$18/lb mark, and BKY’s production cost stands at US$15/lb. With such a meaty profit margin on the horizon, BKY is in excellent shape to make it through to become Europe’s most efficient uranium producer. Whether it can become a dominant supplier in Europe is speculative at this stage and BKY has some work to do before it achieves this aim, stage, so take a cautious approach if considering BKY for your portfolio. This deal provides insight into what future deals may look like. Remember this deal is for the first million pounds only and any subsequent deals will benefit by an anticipated rise in the uranium price. Here are BKY’s official DFS metrics showing all the commercially-alluring goodness — in a nutshell, a solid combination of low operating cost and low capital cost, with a strong return on capital. 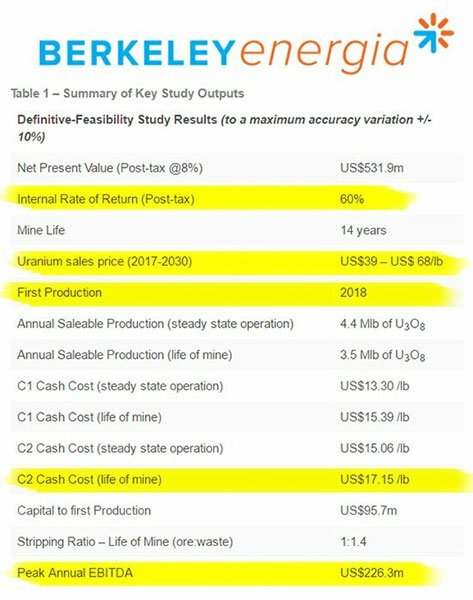 BKY published the results of this DFS in July 2016, confirming that the Salamanca project will be one of the world’s lowest cost producers capable of generating strong after tax cash flow through the current low point in the uranium cycle. As you can see, this formidable junior is making haste to mature into a profitable uranium producer within the coming 1-2 years and generate a peak annual EBITDA of US$226.3 million in the process. BKY’s Salamanca project is set to commence production in 2018, which happens to coincide with growing demand factors for uranium. It is estimated that world uranium consumption is projected to grow at an average annual rate of 4.8% from 2015 to a total of 97,900 tonnes of uranium in 2020. Check out this video where BKY Managing Director Paul Atherley summarises the commercial opportunity currently available in the uranium market, and BKY’s low-cost Salamanca Project. 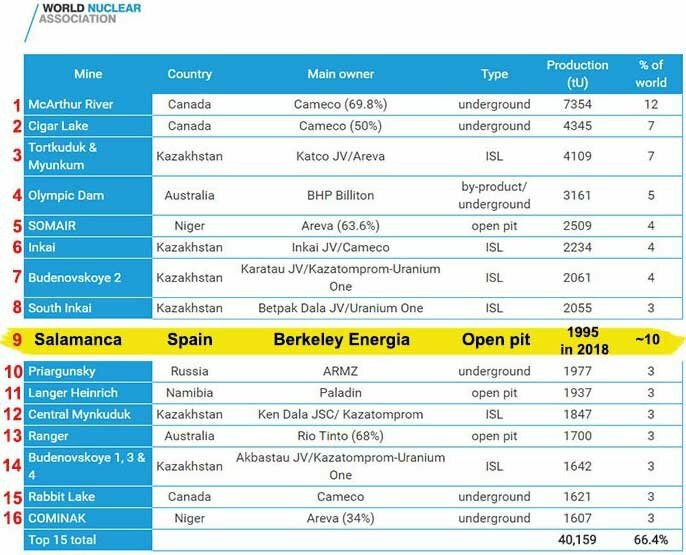 The key takeaway is that the uranium market is prepping for a turnaround — but even if this turnaround doesn’t occur as per expectations , BKY can still remain competitive and Salamanca can stay economically viable, despite depressed uranium prices. Whenever we see rosy future expectations from the companies we cover here at The Next Mining Boom , we always like to have a sniff around what market analysts think. As you can see, BKY has been picking up plaudits throughout the year with UBS, WH Ireland, Numis and FinnCap, all attaching ‘Buy’ ratings to BKY. In a report published in July by FinnCap, its analysts estimated a price target of £1.13 — that’s a 153% increase compared to today’s prices. However, it should be noted that broker price targets are based on a number of assumptions and are no guarantee to eventuate, so don’t rely on them alone if thinking about making an investment. The world requires nuclear energy to fill the energy gap created by rampant industrialisation in developing counties and a growing world population not satisfied with burning wasteful fossil fuels and renewables. Nuclear is clean, provides zero carbon emissions and is a 24/7 source of power. As of July 2015, 30 countries worldwide are operating 438 nuclear reactors for electricity generation and 67 new nuclear plants are under construction in 15 countries. Nuclear power plants provided 11% percent of the world’s electricity production in 2012 which is expected to grow steadily over the coming decade. Shale gas has a shot at helping to fill the energy gap — but this too is being closely monitored (and restricted) by policymakers. Nuclear energy is the most conducive way of ramping up the required amount of energy supply to meet the surging demand. If we look closer, it’s clear that countries such as the US, many Europeans and Japan have already run out into the lead in terms of using nuclear reactors to generate electricity. What China has planned in terms of its energy production in the coming years, could only be described as a gargantuan blitz of nuclear reactor construction. 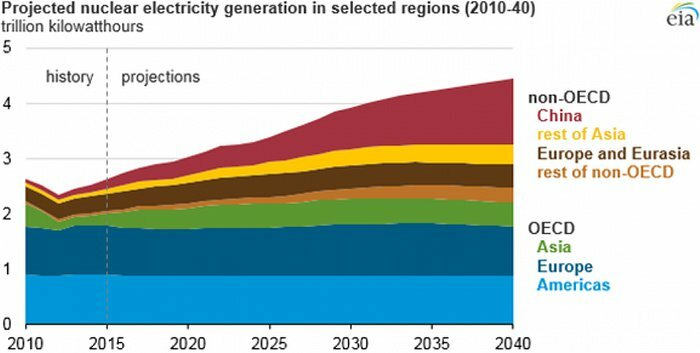 It is estimated that all those power plants will require an additional 40,000MTU over the next four years – representing an 1800% increase since 2012. That’s a huge industry ramp up which BKY could potentially sell into. As long as BKY can get production going, it’s highly likely its product will find a buyer, at an attractive price for the company. The great news for BKY, is that it already has an offtake agreement in place, at a premium to the current spot price. BKY is on course to realise its uranium commercialisation ambitions after over a decade, and $60 million spent in development. This dual-listed near term uranium producer has placed itself between the cracks opened up by economics, and favourable drift away from fossil fuels by the majority of countries worldwide. Energy security is a hot-potato topic right now and policymakers across the globe are scrambling to establish a correct mix of energy sources that suits each country best. Given the economic pressures all government departments are currently under, nuclear energy is stepping in to fill the energy gap, growing all the time because of population growth, rapid industrialisation and greater demand for electricity. BKY therefore has the potential to become a major producer in the uranium industry over the coming years. With operating costs almost exclusively in Euros and a revenue stream in US dollars the project is expected to continue to benefit from the effects of deflationary pressures within the EU. BKY’s Salamanca project is also blessed with many previous years of government funding, as part of an established uranium region — this has meant greatly reduced exploration and development cost for BKY. 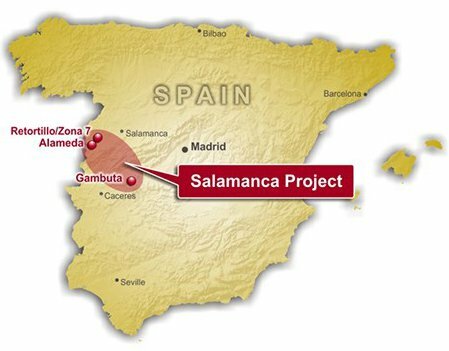 The Salamanca Project is a standout uranium project with a significant production profile and near-term development has already begun with production expected in 2018. ...and if uranium prices improve as many analysts are expecting, BKY will be able to dominate European uranium production and reap the benefits of being a bull at just the right time.